There has been a lot to be bearish about Asia in 2018, but in my view, selling fatigue has set in among investors. Markets are now oversold. While the outlook maybe somewhat cloudy, markets seem to have priced in a substantially and probably unrealistically – more negative outcome. There has been a lot to be bearish about Asia in 2018. If it could have gone wrong, it invariably did: tense geopolitiAAUC, slowing economic growth, and volatile markets clouding sentiment and keeping investors overwhelmingly in cash. The aggregate GDP growth for non-Japan Asia fell to 3.7% in Q3 2018 from 4.3% in Q2 2018, its lowest rate in two years. And while we expect a modest uptick in growth in the coming quarters – alongside an upturn in the global industrial production cycle – overall growth is likely to remain rather subdued in 2019 as monetary policy tightens in response to the Fed. Coincident with lackluster growth – after nine months of underperformance against developed markets – local equity investors seemed to have given up the ghost and capitulated with price levels and selling volumes – right across the region – back to levels last seen in 2016. 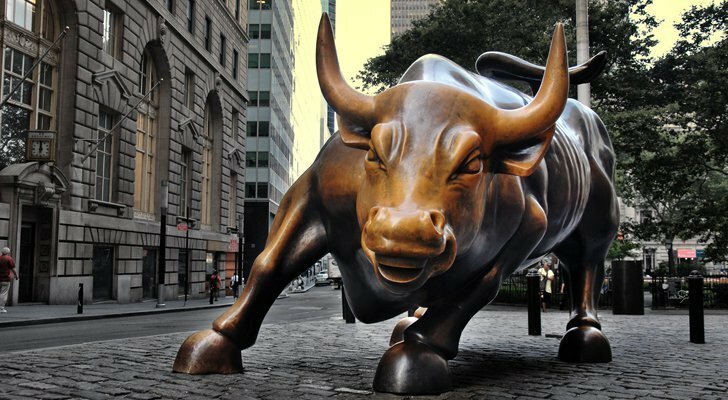 But 2018 is not quite over yet, and readers will have noted in these pages a modest change in sentiment in recent weeks, reflecting improved capital inflows and consolidating price action. As usual, China is the driving force behind this change in fortune with the latest stimulus-induced infrastructure investment growth turning positive and evidence of an uptick in manufacturing investment growth. 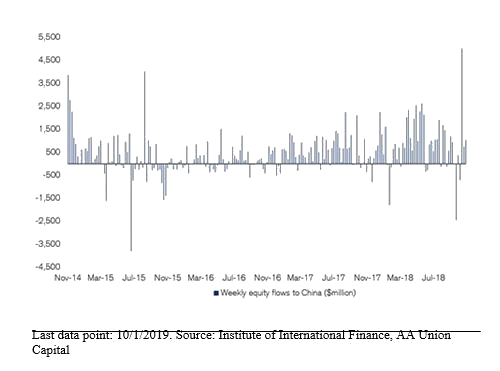 Evidently, with the huge surge in inflows, Chinese investors appear to be positioning for a bounce in risk sentiment. In previous commentaries, I have described China’s equity markets – and its excessively stretched valuations – as a “coiled spring” ready to release at the first credible sign of a buying catalyst. As such, we are closely monitoring the G20 summit in Buenos Aires in the final few days of November where a meeting between US President Donald Trump and Chinese leader Xi Jinping could well result in a political accommodation, which would be received positively by the market. But while China has been the center of attention and a likely major beneficiary of a thaw in trade relations between the two superpowers, what about Asia’s other major markets? 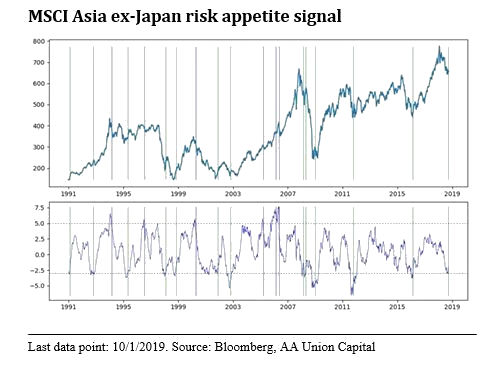 How might they respond to a bounce in risk appetite? To discuss this question, we analyzed and back-tested – from a technical analysis perspective – the MSCI Asia ex-Japan (MXASJ) Index, Hong Kong’s Hang Seng Index (HSI), and the MSCI Singapore Index.